Universal Studios Singapore is a theme park located within Resorts World Sentosa on Sentosa Island, Singapore. It features 28 rides, shows, and attractions in seven themed zones. It was a key component of Genting's bid for the right to build Singapore's second integrated resort. On 8 December 2006, the Singapore government announced that the consortium had won the bid. Construction of the theme park and the rest of the resort started on 19 April 2007. It is the second Universal Studios theme park to open in Asia (Japan being the first), and the first in Southeast Asia. The official plans for the park were unveiled to the public when Universal Studios Singapore released a park map to the public on 20 October 2009. Universal Studios Singapore has since attracted more than 2 million visitors in the 9 months from its opening. The park has been marketed by Universal Parks & Resorts as a "one-of-its-kind theme park in Asia" and promised that the park would be the only one of its kind in Southeast Asia for the next 30 years. The construction of Resorts World Sentosa and Universal Studios Singapore began on 19 April 2008. After almost two years of construction, the park opened on 18 March 2010. Universal Studios Singapore was opened for "sneak peek week" in view of the Chinese New Year Celebrations, from 5 pm to 9 pm every night between 14 and 21 February 2010. Though visitors had to pay SGD$10 to enter the park even-though rides were not operating, tickets for the week were sold out in 2 days. On 5 March 2010, it was announced that the park will open its doors at 8:28 am (UTC+8) on 18 March 2010, for a soft-opening phase. From 13 March 2010, the team members of Resorts World Sentosa and their families had a chance to visit the park before the public has a chance to do so. The park had its soft opening period from 18 March 2010 to 26 October 2010. The official grand opening of the park was held on 28 May 2011, along with the "grand opening gala" being held on 27 May 2011 evening. It had Asian personalities Jet Li, Maggie Cheung, Zhao Wei, and former "American Idol" judge Paula Abdul making an appearance at the gala event, along with some 1,600 guests. In October 2011, Universal Studios Singapore began their Halloween Horror Nights events. On 3 April 2019, Genting Group announced the expansion of Universal Studios Singapore with two new themed areas, Minion Park and Super Nintendo World, with the former replacing Madagascar. 21 Oct 2008 Transformers: The Ride 3D was announced to be a part of the lineup of attractions at Universal Studios Singapore. 24 Sep 2009 Plans revealed for Shrek's Far Far Away and Madagascar theme zones. 20 Oct 2009 Resorts World at Sentosa unveiled the attractions, dining options and merchandise outlets at Universal Studios Singapore. 14 Feb 2010 Start of the eight-day sneak-peek period of Universal Studios Singapore. 18 Mar 2010 Soft-opening of Universal Studios Singapore, with 16 of its 24 attractions opened and fully functioning. 25 Mar 2010 Battlestar Galactica dueling coasters closed due to a technical glitch in the ride. Both rides would remain closed for many weeks thereafter. 02 Jul 2010 Premiering of the Lake Hollywood Spectacular show, which would be presented to park visitors every Friday and Saturday nights. 20 Aug 2010 X-ray findings reveal cracks in the welded joint of the seat-post supports within the Human roller coaster car of Battlestar Galactica, which caused the grounding of both roller coaster rides. 21 Dec 2010 Battlestar Galactica dueling coasters enters final testing stage with newly reinforced coaster cars for both the Human and Cylon coasters. Both rides would be slated to re-open in the first half of 2011. 21 Feb 2011 Official re-opening of the Battlestar Galactica dueling coasters. 16 May 2011 Scheduled opening of Madagascar: A Crate Adventure. 28 May 2011 Grand opening of Universal Studios Singapore. 21 Oct 2011 Halloween Horror Nights makes its debut in Universal Studios Singapore. 03 Dec 2011 Scheduled opening of Transformers: The Ride 3D in Universal Studios Singapore. The ride would have its world premiere at an exclusive evening event on 2 December 2011 with film director Michael Bay present at the event. 31 Dec 2011 Launch of the park's first parade, Hollywood Dreams. 29 May 2012 Sesame Street Spaghetti Space Chase announced to be the newest addition to the park, scheduled to be open by the end of the year. The ride would replace the Stage 28 attraction, which had been cancelled and will be housed within its premise. The park would go on to introduce one stage show, two street shows, as well as meet-and-greets sessions featuring the characters from Sesame Street. 29 Jul 2014 Puss in Boots' Giant Journey announced to be the newest addition to the park. The park would also introduce a new stage show at Far Far Away, with The Dance For The Magic Beans featuring Puss in Boots and Kitty Softpaws, as well as a meet-and-greet right after the show. The new ride would be scheduled to open by 1st quarter of 2015. 08 Apr 2015 Puss in Boots' Giant Journey would officially open to the public. 27 May 2015 Reopening of Battlestar Galactica again, after another two years of inactivity. Universal Studios Singapore is 20 hectares (49 acres) in size, occupying the easternmost part of the 49-hectare (120-acre) Resorts World Sentosa. There are a total of 24 attractions, of which 18 are original or specially adapted for the park. The park consists of seven themed zones surrounding a lagoon. Each zone is mostly based on movies and/or television, featuring their own attractions, meet and greet locations, over 30 restaurants and food carts, and 20 retail stores and carts located around the park. Hollywood Themed after the real Hollywood Boulevard of the 1970s. Framed by "dynamic" architecture, palm trees and a replica of the Hollywood 'Walk of Fame'. New York Themed after post-modern New York City. Features replicas of New York landmarks. The area is enhanced by neon lights and flanked by street facades. Sci-Fi City Themed after what cities and metropolis "may look like in the future", according to popular science fiction franchises. Ancient Egypt Themed after the Egyptian architecture and artifacts found during the "Golden Age of Egyptian Exploration in the 1930s". The Lost World Themed after two franchises, Jurassic Park and Waterworld, which each have separate areas within the zone. Far Far Away Themed after The Kingdom of Far Far Away featured in DreamWorks Animations' Shrek. Madagascar Themed after DreamWorks Animations' Madagascar. The zone features a displaced cargo ship and river. Hollywood is the main entrance area of the park. 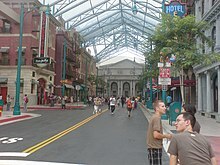 Its only attraction, a broadway-style theatre, is accompanied by several restaurants and a variety of shopping locations. The zone is filled with Hollywood-inspired architecture and palm trees, including a replica of the Hollywood Walk of Fame. New York City is based on the original New York City, during the era of post-modernisation. The zone features various landmarks commonly portrayed in movies including the city skyline, neon lights, facades, and sidewalks. This zone also has a replica of the New York Public Library. Special Sesame Street character appearances include: Elmo, Big Bird, Count von Count, Abby Cadabby, Bert, Ernie, Grover, Cookie Monster,Oscar the Grouch and The Joker. Sci-Fi City is themed to a supposed metropolis of the future. It is the home of a pair of dueling roller coasters. Ancient Egypt is based on the historical adaptation of Ancient Egypt during the 1930s Golden Age of Egyptian Exploration. It features obelisks and pyramids which are typical of Ancient Egypt. Also featured are Pharaohs' tombs which were supposedly commonly discovered during that era. This zone relies on the depictions made in the popular film franchise, The Mummy, starring Brendan Fraser. 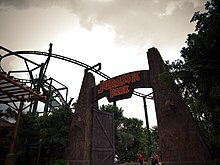 Jurassic Park entrance with Canopy Flyer in the background. Jurassic Park Rapids Adventure's final splashdown. The Lost World contains many traditional attractions present in most Universal Studios parks around the world and is divided into two sub areas: Jurassic Park and Waterworld. Jurassic Park, based on the popular film franchise by Steven Spielberg and novels by Michael Crichton, features the newly redesigned Jurassic Park Rapids Adventure which is based on the water rides in other Universal Studios parks. Waterworld, based on the film Waterworld starring Kevin Costner, is a stadium that features a live show performance. Far Far Away is inspired by DreamWorks Animation's Shrek franchise. The zone consists of many locations from the film series, with a landmark in the form of "Far Far Away Castle". Character appearances include Shrek, Donkey, Puss in Boots, Princess Fiona, Pinocchio and Prince Charming. A 3-D stereoscopic show with physical effects. The boat facade that houses Madagascar: A Crate Adventure. Madagascar is inspired by the DreamWorks Animation franchise of the same name. The zone features a tropical jungle theming as well as two rides. Character appearances include: Alex, Gloria, King Julien, Skipper, Kowalski, Private and Rico. ^ a b c d e f g "Map of Universal Studios Singapore". 20 October 2009. Archived from the original on 21 July 2010. Retrieved 9 June 2010. ^ "Singapore's success in Universal Studios leads Asia in theme park boom". 20 September 2010. ^ "Resorts World at Sentosa". e-Travel Blackboard Asia. 29 January 2008. Archived from the original on 13 September 2008. Retrieved 21 October 2008. ^ Lim, Jessica (2010). Universal Studios opens Sun. Retrieved 7 June 2010 from Stratis Times. ^ Yahoo News (2010). Sentosa Theme Park opens 18 March. Retrieved 7 June 2010 from Yahoo News Singapore Archived 8 March 2010 at the Wayback Machine. ^ Resorts World Sentosa (2010). 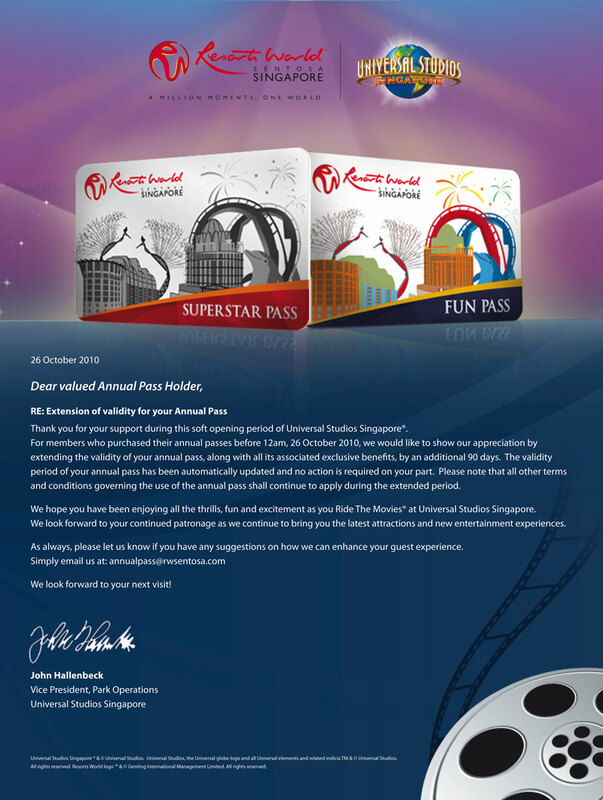 Extension of validity for your annual pass. Retrieved 8 November 2010 from Picasa. ^ "Star-studded opening for Universal Studios Singapore". Channel NewsAsia. 28 May 2011. Retrieved 30 May 2011. ^ a b "Fear has found a new home". RWScoop wtf. 25 August 2011. Archived from the original on 1 September 2011. Retrieved 12 September 2011. ^ Mohan, Matthew (3 April 2019). "Singapore's two integrated resorts set to grow with S$9 billion investment plan". CNA. Retrieved 3 April 2019. ^ "Transformers (ride attraction) to hit Singapore in 2011". Channel NewsAsia. 21 October 2008. Retrieved 1 January 2011. ^ "Universal Studios theme-park at Sentosa to offer 18 unique rides and attractions". Channel NewsAsia. 20 October 2009. Retrieved 10 January 2011. ^ "Battlestar Galactica closes due to technical glitch". Channel NewsAsia. 25 March 2010. Retrieved 1 January 2011. ^ "Battlestar Galactica shuts down". The Straits Times. 26 March 2010. Retrieved 1 January 2011. ^ "Battlestar Galactica may be closed for weeks". Channel NewsAsia. 15 April 2010. Retrieved 1 January 2011. ^ "July updates for Universal Studios Singapore". Resorts World Sentosa Blog. 28 June 2010. Retrieved 10 January 2011. ^ "Cracks found in welded seat-post support of Battlestar Galactica's Human coaster cars". Channel NewsAsia. 20 August 2010. Retrieved 1 January 2011. ^ "Battlestar Galactica enters final testing stage". Channel NewsAsia. 21 December 2010. Retrieved 1 January 2011. ^ "Battlestar Galactica roller coaster ride to reopen". Yahoo! Singapore News. 2 February 2011. Retrieved 2 February 2011. ^ a b "A Crate Adventure – Madagascar". Universal Studios Singapore. Archived from the original on 5 October 2011. Retrieved 13 June 2010. ^ Genting Singapore PLC (2010). "Financial Statements for the Nine-Month Period Ended 30 September 2010 Part I – Information Required for Announcements of Quarterly (Q1, Q2 & Q3), Halfyear and Full Year Announcements" (PDF). Archived from the original (PDF) on 22 November 2010. Retrieved 13 November 2010. ^ "Universal Studios Singapore® Grand Opening". Resorts World Sentosa. Archived from the original on 18 April 2011. Retrieved 15 April 2011. ^ a b Resorts World Sentosa (2010). "Transformers" To Be Developed As Theme Park Mega-Attraction At Universal Studios Hollywood and Universal Studios Singapore. Retrieved 7 June 2010 from Official Site Archived 15 December 2016 at the Wayback Machine. ^ "BREAKING NEWS: TRANSFORMERS The Ride Premieres at Universal Studios Singapore® on 3 December 2011". RWS Blog. Retrieved 27 October 2011. ^ "Transformers The Ride debuts Dec 3". Channel News Asia. 27 October 2011. Retrieved 27 October 2011. ^ "Hollywood Dreams Parade Information". RWS Blog. Archived from the original on 8 January 2012. Retrieved 2 January 2012. ^ "Stage 28 (Universal Studios Singapore)". Parkz. Retrieved 18 August 2012. ^ "Universal Studios Singapore confirms new Sesame Street dark ride and live shows". Retrieved 29 May 2012. ^ "Universal Studios Singapore confirm new ride and live shows". Retrieved 29 July 2014. ^ "First peek at Puss In Boots' Giant Journey at USS". Retrieved 8 April 2015. ^ "Universal Studios Singapore's main attraction Battlestar Galactica reopens". Retrieved 27 May 2015. ^ "Best things to do in Universal Studios Singapore". Retrieved 12 December 2016. ^ Sentosa, Resorts World. "Attractions in Singapore - Universal Studios Singapore - Resorts World Sentosa". www.rwsentosa.com. ^ New York – Universal Studios Singapore. Retrieved 6 June 2010 from the Official Site Archived 26 August 2012 at the Wayback Machine. ^ Lights, Camera, Action – New York – Universal Studios Singapore. Retrieved 6 June 2010 from the Official Site Archived 5 October 2011 at the Wayback Machine. ^ a b c d e Restaurants and Dining Outlets at Universal Studios Singapore. Retrieved 6 June 2010 from the Official Site Archived 5 October 2011 at the Wayback Machine. 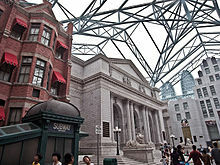 ^ Sci-Fi City – Universal Studios Singapore. Retrieved 6 June 2010 from the Official Site Archived 2 February 2011 at WebCite. ^ Accelerator – Sci Fi City – Universal Studios Singapore. Retrieved 6 June 2010 from the Official Site Archived 5 October 2011 at the Wayback Machine. ^ a b "Battlestar Galactica ride at Universal Studios Singapore closed". Channel NewsAsia. 9 August 2013. Archived from the original on 14 August 2013. Retrieved 11 August 2013. ^ a b c d e Shopping Directory – Universal Studios Singapore. Retrieved 6 June 2010 from the Official Site Archived 5 October 2011 at the Wayback Machine. ^ a b Nicholas, Dejiki (14 November 2011). "Universal Studios Singapore – Update 11/2011". Photos. dejiki.com. Retrieved 23 November 2011. ^ Ancient Egypt – Universal Studios Singapore. Retrieved 6 June 2010 from the Official Site Archived 5 October 2011 at the Wayback Machine. ^ "fact sheet (MICE)" (PDF). 20 January 2009. Archived from the original (PDF) on 7 October 2009. Retrieved 25 September 2009. ^ Revenge of the Mummy – Ancient Egypt – Universal Studios Singapore. Retrieved 6 June 2010 from the Official Site Archived 5 October 2011 at the Wayback Machine. ^ Treasure Hunters – Ancient Egypt – Universal Studios Singapore. Retrieved 6 June 2010 from the Official Site Archived 5 October 2011 at the Wayback Machine. ^ The Lost World – Universal Studios Singapore. Retrieved 6 June 2010 from the Official Site Archived 5 October 2011 at the Wayback Machine. ^ Canopy Flyer – The Lost World – Universal Studios Singapore. Retrieved 6 June 2010 from the Official Site Archived 5 October 2011 at the Wayback Machine. 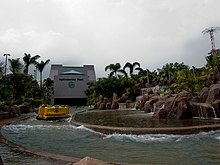 ^ Jurassic Park Rapids Adventure – The Lost World – Universal Studios Singapore. Retrieved 6 June 2010 from the Official Site Archived 5 October 2011 at the Wayback Machine. ^ Water World – The Lost World – Universal Studios Singapore. Retrieved 6 June 2010 from the Official Site Archived 5 October 2011 at the Wayback Machine. ^ Amber Rock Climb – The Lost World – Universal Studios Singapore. Retrieved 6 June 2010 from the Official Site Archived 5 October 2011 at the Wayback Machine. ^ "Amber Rock Climb (Universal Studios Singapore)". Parkz. ^ Dino-Soarin' – The Lost World – Universal Studios Singapore. Retrieved 6 June 2010 from the Official Site Archived 5 October 2011 at the Wayback Machine. ^ Shrek 4D Adventure – Far Far Away – Universal Studios Singapore. Retrieved 6 June 2010 from the Official Site Archived 5 October 2011 at the Wayback Machine. ^ Donkey Live – Far Far Away – Universal Studios Singapore. Retrieved 6 June 2010 from the Official Site Archived 5 October 2011 at the Wayback Machine. The show is located at Hook's Night Club within the Far Far Away zone. ^ Enchanted Airways – Far Far Away – Universal Studios Singapore. Retrieved 6 June 2010 from the Official Site Archived 5 October 2011 at the Wayback Machine. ^ Puss in Boots' Giant Journey - Far Far Away - Universal Studios Singapore. Retrieved 22 June 2015 from the Official Site[permanent dead link]. ^ Magic Potion Spin – Far Far Away – Universal Studios Singapore. Retrieved 6 June 2010 from the Official Site Archived 5 October 2011 at the Wayback Machine. ^ a b "Map USS". 20 October 2009. Archived from the original on 23 October 2009. ^ a b Madagascar – Universal Studios Singapore. Retrieved 6 June 2010 from the Official Site Archived 5 October 2011 at the Wayback Machine. ^ King Julien's Beach Party-Go-Round – Madagascar – Universal Studios Singapore. Retrieved 6 June 2010 from the Official website. 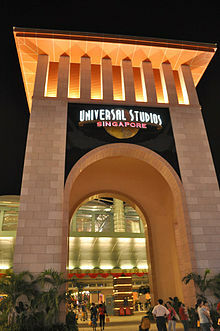 Wikimedia Commons has media related to Universal Studios Singapore.